After using Surface Book i7 with Performance Base every day for a moth, senior writer Sarah K. White offers her impression of the Surface Book 2. When Microsoft held an event last October, everyone thought it was prepping to announce the Microsoft Surface Pro 5 or Surface Book 2. Instead, we got the new Surface Studio, Windows Creative Update and a beefed-up Surface Book i7 with Performance Base. The Performance Base addition brought a redesigned keyboard base to the device, while the tablet display remained the same. With the hope of swaying creative professionals away from Apple, these internal updates include an NVIDIA GPU, a 6th generation Intel Core i7 processor and a 1TB hard drive. I've used the Surface Book i7 with Performance Base regularly for the last month, and there's a lot that I love about the it. Even though it's a device targeted at creative professionals, it's a notebook that will suit anyone that values performance. This should come as no surprise, but the performance on the updated Surface Book i7 has been consistently impressive. But when I talk about performance, it's important to remember that I'm not an artist, a 3D video editor or even a heavy gamer. Pushing the limits of my notebooks typically means I'm 100 tabs deep in Google Chrome or I'm rehashing my youth by playing The Sims 4. But the Surface Book happily encourages my pathological level of browser tabs without a single complaint. And light gaming was more enjoyable; everything ran faster and smoother than on my HP Spectre x360, which houses a 6th gen Intel i7 processor and integrated graphics. I wouldn't say it's worth spending over $3,000 on a notebook just to browse the internet with wild abandon and occasionally play The Sims 4 on the highest settings, but I can say my experience with the Surface Book this past month has truly spoiled me. If you need that level of performance, the Surface Book i7 is a strong contender and offers best performance you can get in this class of 13-inch notebooks. And, when you consider what it packs under the hood, it's incredibly thin and lightweight. While Surface Book i7 with Performance Base is a compact device for the performance it delivers, compared to other, less powerful 13-inch notebooks, it is kind of a beast. The display is a bit taller than your average 13-inch display, and with the dual cooling fans to support the improved GPU, it's slightly thicker and heavier than even the original Surface Book. And since I'm not someone who realistically needs that level of performance daily, I'd be more apt to grab the Surface Pro 4 if I'm travelling. The size and form factor are what would prevent the Surface Book from replacing my need for another device. But that's because my average workday consists of a steady Wi-Fi connection, the Microsoft Suite, Slack and, on rare occasion, Adobe Photoshop Elements. For me, carrying this updated Surface Book i7 on a work trip would feel excessive. I just don't need that level of performance on an average day and it would be too expensive to replace if stolen or damaged. If I needed to use 3D software or other high-powered design and editing software as part of my job, I I would be excited to travel with the Surface Book. It's certainly light and compact for someone who needs that level of performance, but for the average business user, or at least in my case, the Surface Pro 4 offers more than enough in a smaller package. There's always a caveat to hybrid devices; they promise you both a tablet and notebook experience, but the truth is that they always fit more into one category. 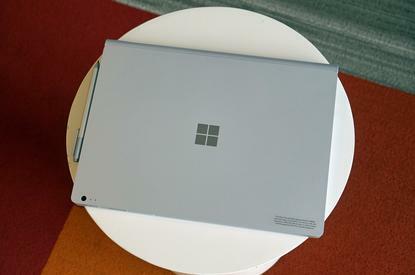 With its built-in trackpad and full Windows 10 OS, the Surface Pro 4 feels more like a notebook, while the iPad Pro, running iOS 10 and lacking a track pad, feels more like a tablet. They each fit different needs -- some people need a notebook more often than a tablet and vice versa. While the iPad Pro and Surface Pro 4 share more overlap in each category, the Surface Book is almost entirely a notebook that happens to have a detachable display. Without the keyboard dock, the tablet feels cumbersome and, since it lacks the kickstand on the Surface Pro 4, you can't just prop it up. Personally, I haven't found a need to use the Surface Book display as a tablet, and the same goes for my HP Spectre x360. I rarely find myself using either device in tablet mode, but I do frequently interact with the touch displays. I can see how if you were an artist, designer or worked in the field, the detachable display might be a bonus when combined with the Surface Pen. But for my personal needs, I'd be more inclined to reach for my iPad Air 2 or Surface Pro 4 before the Surface Book display. There are so many minimal, thoughtful features that stand out on the Surface Book. The design is unique -- and love or hate the hinge, it's still a sleek device. Most of all, I appreciate that Microsoft nods to the industrial-chic design popularized by Apple without mimicking it the way other manufacturers have. Beyond the overall design, I also can't say enough good things about the Surface Book keyboard -- an often-overlooked feature on notebooks. It has the perfect key travel and the chiclet keys are spaced out just enough to make it comfortable to type. The Surface Book's trackpad offers just the right amount of responsiveness, especially compared to the hyper-sensitive trackpad on my HP Spectre x360. Battery life on the device is also unmatched -- thanks to the second battery. You can easily get through the day on one charge with light use. With heavier use, or if you're using battery draining peripherals like a wireless mouse, you can still get a solid six to eight hours before looking for an outlet. Buy now or wait it out? With so many hybrid rumors on the horizon for 2017, I can't help but wonder if the Surface Book i7 with Performance Base is just a taste of what we might see in the purported Surface Book 2. The updates in this case were purely internal and focused on packing in as much performance as possible. In the near future, there's the potential for 7th-generation Kaby Lake Processors and possibly even more graphics cards to choose from. Right now, the Surface Book i7 with Performance Base is so close to being the do-it-all notebook that can handle your work, editing, entertainment and gaming needs. But, considering the cost of this device at just over $3,000, I would say it's worth waiting to see what Microsoft has in store for the next Surface Book update. It reminds me of when the first Microsoft Surface was released -- the Surface Book i7 with Performance Base feels more like a taste of what's to come.